Abilitations Speech Bin Button Talk is compact, making it easy to slip in you pocked or use the built-in magnet to display on the fridge or any metal surface. 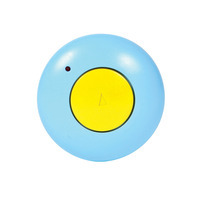 Button Talk is a great augmentative tool for children to utilize between home, school and activities. Record lock feature eliminates accidental erasure. This versatile device records a 10-second message and the large play button insures easy use. Requires Large Cell Battery (not included).